Review: The descriptions of the character’s driving, streets, turns and buildings, or the settings in which he finds himself helps set the tone and mood of the story. Frank Moore is direct and brutal, yet I found him believable and even sympathetic to a degree because he does some of the acts that might cross our minds to do: kill the unrepentant druggie and rid the world of one more useless drain on society. Sometimes the detachment left me drifting, or the seeming randomness of thought, but it was all of a piece. It was as if the story itself was a character with clear personality, a certain style of movement and purpose. Frank Moore, his wife, the other players were puppets on a stage. 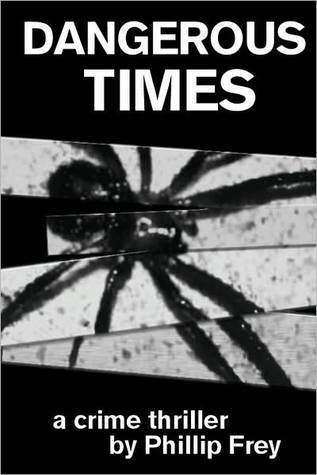 I found “Dangerous Times” to be both intriguing, for it’s straightforward and direct style of narration that fit the story to a tee; and terrific in it’s intangible build of suspense. I confess I was dismayed a bit by the length, which was 350 pages in .pdf format, but this was accounted for by the 1.5 spacing and Courier font. Not an easy one for eyes, but again, it did seem to fit the “Dangerous Times,” making for outstanding perspective. Description: Frank Moore is a misanthrope with a hellish plan, a malevolent antagonist so compelling that the reader will want Frank to succeed, until the unexpected occurs. After a frustrating search he has found his look-alike, a close-enough double: John Kirk. Auto mechanic John Kirk leads a troublesome life in San Pedro, common troubles that escalate to the dreadful when Frank Moore comes to town. Phillip Frey grew up in Cleveland, Ohio, where he performed as a child actor at The Cleveland Playhouse. The day after he graduated high school he moved to Los Angeles and attended Los Angeles City College. Enrolled in their Theatre Arts Department, Phillip performed in many of their plays while also performing in local theater. He then moved to New York, where he performed with The New York Shakespeare Festival, followed by The Repertory Theatre of Lincoln Center. With a change of interest Phillip wrote, directed, and edited 3 short films, all of which had international showings, including The New York Film Festival. With yet another change of interest he returned to Los Angeles to become a produced screenwriter. “Dangerous Times” is Phillip Frey’s first novel.